The 11-storey buildings, with about one million sq ft of net lettable area, will enter the market over the next five years, said founder and managing director, Mah Siew Sian. "We expect that many companies will be moving out of the city centre because of traffic congestion. 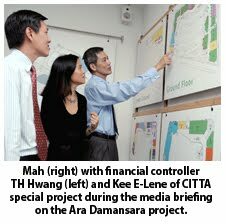 Some are targeting Ara Damansara, which is a new area and a well-planned township. "We believe there will be a market for our properties. People want a comprehensive environment which is why there is a success story for Mid Valley City," Mah said. The group is finalising designs and expects to launch the first two blocks by the third quarter of next year. The buildings will be sold en bloc. It is already in talks to sell one block to information technology group Formis Bhd for around RM150 million. Several multinational companies in the oil and gas and consumer business are also keen. The towers will be complemented by the group's new RM280 million retail mall, dubbed CITTA, which will open next January. Half of CITTA, an open air design three-level mall with 130 retail outlets, have been taken up. Some of the big retailers include Harvey Norman, MBO cinemas and Julia Gabriel and Chiltern House. Under Budget 2011, the Government’s proposal to help first time home buyers and those earning less than RM3,000 will benefit those living outside the Klang Valley. The 10% down-payment guarantee by the Government is limited to houses priced below RM220,000 while the 50% stamp duty exemption on instruments of transfer are for houses not more than RM350,000. While the move is much lauded and applauded, there are not many landed units priced at RM350,000 and below in the Klang Valley today. Which means those who want to go for this scheme will have to buy a condominium or an apartment. And if one wants to take advantage of the 10% downpayment, one has to buy a property that is RM220,000 and below. There are, of course, properties further away in the Klang or Shah Alam in this price range. One will be hard pressed to find something within this bracket in Petaling Jaya unless one opts for some densely populated condominium enclave. With the number of young people migrating to the city in search for work, most of them will have to rent before they eventually buy their own homes. About 50 years or so ago, the Selangor State Development Corp (PKNS) were building single-storey affordable housing that cost less than RM20,000 in Petaling Jaya. Much of Petaling Jaya then – and today – are leasehold land because they are state land. Twenty-thousand ringgit may seem a paltry sum today but for folks back then, many had to pawn their jewellery and with the help of relatives, pool money together to have a roof over their heads. Young people from the lower ranks of the civil service benefited from PKNS housing. There was another developer whose mission was to provide civil service in the higher categories with more up-market properties in Damansara Heights, Kuala Lumpur. Today, things are very different. While PKNS continues to build houses in the urban centres, they seem to be concentrating on building condominiums. A clear example is Kota Damansara, Petaling Jaya where PKNS teamed up with developers in joint-venture developments to build high-rise properties. They do build single-storey houses but these are outside city centres in locations such as Bernam Jaya and Antara Gapi. In Klang, PKNS is building some low-cost flats. In the aftermath of the financial crisis in 1997/98, affordable housing were those capped at RM250,000 and many private developers went into this segment post crisis. There was a huge demand for them. Several years later, to get better profits, developers went on to build “lifestyles” homes where double-storey houses cost closer to RM600,000. Because it is becoming increasingly impossible to find houses around the RM350,000 price range in the Klang Valley, perhaps PKNS can think about entering into joint ventures with private developers to build houses which may not be all that affordable. The government agency is offering a broad spectrum, from low-cost flats in Klang to semi-detached and bungalows in Shah Alam. There is also something to be said about low-cost housing across the board. Simply because they are low cost, developers cut them rather small, at about 600 sq ft of four- or five-storey walk-ups with no management services. These projects have the potential – and some of them do – to become urban slums. After several years, the place becomes really deplorable because there is no sinking fund and unkempt, because there is no management fees. Eventually, social problems arise. Many of these units are also rented out to foreigners and become crime-infested until the locals living there themselves decide to leave. With the changes in the economy, global and local, which many have never seen in our life time, housing will only become more crucial in the urban centres. State agencies should consider if they need to narrow down their offering to provide for the less-well-to-do with proper and decent housing that are manageable financially and physically so that they at least maintain their value. State economic developments corporations like the PKNS and their counterparts can form part of the government machinery to help first time house buyers. In Singapore, there is the National Housing Board to meet this aim. Which is why more than 90% of Singaporeans have their own homes. They do not need to rent. The same goes for Hong Kong. Both Singapore and Hong Kong are relatively more manageable because they are small. But we in Malaysia have various state economic development corporations and providing affordable housing is part of the game plan. So, if it is affordable housing, why go into building bungalows and semi-detached units? Stick with affordable housing. Assistant news editor Lee Cheng thinks there is a need for state agencies to look into providing affordable housing in urban centres. While it's obvious some people got ahead of themselves in shooting down the plan, it is also fair to say that not all questions raised about the 100-storey project were adequately addressed. The apparently growing opposition to plans by Permodalan Nasional Bhd (PNB) to build a 100-storey skyscraper as part of the Warisan Merdeka integrated project is a classic example of what can go wrong when information is either badly presented or poorly received. Prime Minister and Finance Minister Datuk Seri Najib Razak, when announcing the project in his 2011 Budget speech on October 15, said the landmark, which will be developed by PNB, is to be completed by 2020. The project would comprise a 100-storey tower, the tallest in Malaysia, and would retain Stadium Merdeka and Stadium Negara as national heritage. The total project cost is RM5 billion, with the tower to be completed by 2015. Within minutes after the speech, the Opposition picked on the mega project, calling it a waste of funds. Put the money to better use by building more schools, improving rural infrastructure, and helping the needy, they said. It would affect returns from PNB unit trusts, others echoed. 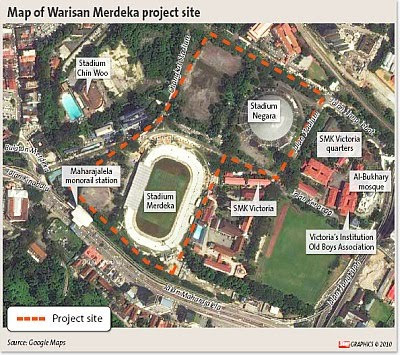 Suddenly, in their eyes, Warisan Merdeka became a government-funded project. It wasn't. It was PNB's, and PNB is not in the business of building schools or upgrading roads and electricity supply. Similarly, a facebook group - 1M Malaysians Reject 100-storey Mega Tower - was set up (it is not immediately clear by whom) and has more than 92,000 fans as at 5pm yesterday. The project is also a hot topic on blogs and Internet forums. PNB had a press conference on October 20, five days after the budget, where we came to know that the project would also have a shopping complex and condominiums, and that the tower itself would cost RM2.5 billion to RM3 billion. The RM5 billion figure included other components of the development, and also factored in improving infrastructure in the area. Its president and group chief executive Tan Sri Hamad Kama Piah Che Othman is confident that Warisan Merdeka will create spillover benefits. For starters, it will generate about 5,000 jobs in the development stage, and boost property prices in the area. He said PNB has the capability to finance the project through internally-generated funds, and as an investment house, would seek to optimise returns from the development. It expected to yield returns of 8-10 per cent. This has been PNB's policy with all its investments over the years, and its track record speaks for itself. We also learnt that PNB had been planning to develop the land since 2004, conducted annual reviews, and decided that now was the right time to do it. Clearly, this wasn't a flight of fancy hatched up one night just to boast as some people perceive it to be. While it's obvious some people got ahead of themselves in shooting down the plan, it is also fair to say that not all questions raised about the project were immediately and adequately addressed. 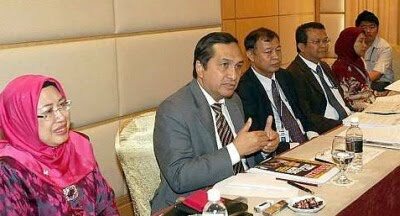 In the days to come, there could well be legitimate concerns about Warisan Merdeka and PNB's role in it, particularly on the part of its more than nine million unitholders, and Malaysians in general. The government, too, needs to clear up remaining confusion and scepticism about the project's benefits. Let's hope the message gets across better next time. PETALING JAYA: Malaysia Building Society Bhd (MBSB) is optimistic of hitting, within the next 12 months, its RM1bil loans target for its newly launched home mortgage programme called MBSB Ultimate, given its attractive features and financing, says chief executive officer Datuk Ahmad Zaini Othman. “We are confident of achieving the RM1bil target as this tailor-made programme offers among others, loan tenure up to 70 years of age. We also have sales personnel from our 33 branches to promote this programme,” he told reporters yesterday after the launch of the programme. MBSB Ultimate is targeted at properties priced from RM500,000. Ahmad Zaini said MBSB’s outstanding home mortgage portfolio currently stood at about RM5bil. He also said MBSB planned next year to come out with three or four new product packages for home mortgage and retail financing. Chairman Tan Sri Abdul Halim Ali said MBSB Ultimate was the expression of MBSB’s inspiration in developing a home mortgage programme that would be the most definitive in the market. “With the current drive and momentum set by the MBSB team coupled with new strategies, I am confident that MBSB will be able to re-establish its position as a significant player in the home financing market,” he said. Meanwhile, commenting on the group’s third quarter results that were announced on Thursday, Ahmad Zaini said overall, its nine-month revenue performance had surpassed its full-year results in 2009 by more than 50%. “We expect in the next three months our performance will continue to be strong, given the good numbers that we are having now,” he said. MBSB’s third-quarter net profit fell 23% to RM40.5mil due to loan loss allowances made for impaired loans. Its revenue almost doubled to RM317.66mil for the three months ended Sept 30. For the nine months ended Sept 30, MBSB reported net profit of RM133.2mil on revenue of RM890.8mil. It recorded net profit of RM57.2mil and revenue of RM538mil for 2009. NUSAJAYA: Property developers in Johor are becoming more creative and innovative in promoting their projects to potential buyers. Apart from putting up nicely decorated show homes, developers are also bringing celebrities in for their project launches in hopes to attract crowds. Weekends and public holidays are the favourite times for developers to launch new projects with a carnival-like atmosphere. However, Country View Bhd has taken one step further by setting up an art gallery at its sales office at the Nusa Sentral housing project here. “It showcases 11 modern contemporary art pieces collected by the company over the years,” said Country View marketing manager Andrew Tan. The project on a 121.40ha site is located along Jalan Gelang Patah-Ulu Choh and will keep the company busy for the next eight years. He said the art gallery would give an opportunity for customers to appreciate the art work and give them ideas to decorate their houses too. Tan said although it was still a long way for ordinary Malaysians to show interest and deep appreciation for contemporary art pieces, the company believed someone has to take the initiative to start it. He said interested customers can also purchase the paintings. “We also welcome local painters to come to our gallery and promote their works to potential house buyers,” said Tan. Couple Haw Yew Hock and Chow Yit Sin from Lima Kedai who planned to buy a house said this was the first time that a property developer had set up an art gallery at its sales gallery. “It is something different and probably we can also pick up the ideas by putting up a painting or two in our new house too,” said Haw. PERMODALAN Nasional Bhd (PNB) has studied market trends before deciding to embark on the Warisan Merdeka development, its president and group chief executive Tan Sri Hamad Kama Piah Che Othman says. The 100-storey tower will be a five-star green building which is still uncommon in Kuala Lumpur. “We believe it will be able to meet the market’s growing need for such office space,” he explained when asked about the rationale for the tower project. At a time when the world economy is still uncertain and amid rising prices, many Malaysians have questioned the necessity for the RM2.5bil to RM3bil tower project after Prime Minister Datuk Seri Najib Tun Razak announced the project in his budget speech last Friday. Responding to questions on the project recently, Najib stressed the Government did not instruct PNB to construct Warisan Merdeka and that it was the investment agency’s board of directors that had wanted to embark on the project. He said the area would be a business centre for both the bumiputra and non-bumiputra, and could be one of the country’s attractions that will generate profit. Developers and property consultants have urged PNB to undertake extensive and in-depth feasibility and market studies to weigh the cost-benefit and potential impact of the tower on the property market. The public also wants an environmental impact assessment study to be done on the project to look at the impact to the social system, the traffic situation and suitability of the site. Most of the concerns are on whether the high-impact commercial development will cause an over supply of office space in the capital city, and the impact of the skyscraper to the worsening of the heavy traffic jams in the area. There are also a number of schools in the vicinity and the expected heavier flow of the traffic have worried students, parents and the school authorities. Hamad says PNB is looking to have the mass rapid transit (MRT) plying the Warisan Merdeka route. “We are aware of the public’s concerns that the traffic jam in the area will worsen with the tower project, and will be working with the relevant authorities to look at ways to improve the infrastucture and traffic flow in the area,” he adds. Hamad also allays fears that funds from unit trust investors or the Government will be used to finance the project. He says PNB has enough funds to finance the whole development if need be but he does not rule out borrowings if interest rates are reasonable. On the project’s positioning, Hamad stresses that the heritage elements of Merdeka Stadium will be one of the central themes and highlights of the project. If that is the case, industry observers have asked whether PNB will look at introducing a full-fledged culture village around the historical site that can also double up as function destinations to ensure the the project will remain functional. To avoid the project becoming a “white elephant” like many observers fear will happen, the culture village should be kept alive with interesting cultural performances and events on a daily basis. Perhaps, the National Museum should be moved there as its historical ambience is the most appropriate to showcase important things and events of the country’s past. Hamad stresses that the building is not being designed to outshine any particular organisation, including the Petronas Twin Towers which have been and will continue to be Malaysia’s icon. Besides being the country’s most famous landmark, the 88-storey Petronas Twin Towers are the world’s tallest twin buildings today. Completed in 1998 at a cost of US$1.2bil, they were the tallest buildings in the world until they were “dethroned” by Taipei 101 which was completed in 2004. The twin towers also have world renowned Argentine-American architect César Pelli, to thank for its unique and timeless design. The towers were constructed largely of reinforced concrete, with a steel and glass facade which have given them the magical and glittering effect. KUALA LUMPUR: Karambunai Corporation Bhd (KCB) has clarified that it has neither received any notification from the government nor has it signed any agreement with or have shareholding in special purpose vehicle (SPV) originated by its controlling shareholder, together with a Beijing-based contractor, to develop an integrated eco-nature resort in Karambunai. Karambunai Corp's controlling shareholder is low-profile tycoon Tan Sri Dr Chen Lip Keong. Karambunai Corp is one of the largest resort operators in Kota Kinabalu with its Nexus Karambunai Hotel resort in Sabah. The Main Board-listed company has 600ha of land in the Karambunai peninsula. About 130ha have been used to build the five-star Nexus Resort Karambunai, Nexus Golf Resort Karambunai and 200-odd units of luxury beachfront villas. The company came under the spotlight after it was mentioned in the 2011 Budget Speech that there were plans to develop an integrated eco-nature resort in Karambunai. The government announced in its Budget 2011 on Oct 15 that it would allocate RM100 million to part finance developer and resort operator Karambunai Corp’s integrated eco-tourism resort in Kota Kinabalu. The RM3 billion project is slated to start next year and is expected to take about five years to complete. In a filing to Bursa Malaysia on Friday, Oct 22, KCB said the promoter was a SPV specifically incorporated to assess the feasibility of investing in the Karambunai Peninsula. “Together with its local and overseas consultants, including its financial consultant China Construction Bank International, the SPV aims at bringing in foreign direct investments to Malaysia and has presented proposals to the Malaysian government to assess the relevance and importance of developing Karambunai, Sabah to spearhead the growth of tourism in the Eastern corridor of Malaysia. “Up to date, Karambunai Corp has no shareholding in the SPV, nor has it received any official notification from the government or signed any MoU (Memorandum of Understanding) or agreement with the SPV to develop Karambunai yet,” it said. However, both the management of Karambunai Corp and SPV have concrete, specific, clear time-line plans and commitments to the Malaysian government to attain the desired results under Economic Transformation Programmes as envisaged by the Government, it said. The company said its board of directors was of the opinion that there were not yet corporate developments which merit disclosure. Members of the Malaysian Association for Shopping and Highrise Complex Management are confident that the shopping industry will register double-digit growth by next year. Shopping mall operators and retailers expect their businesses to increase up to 15 and 6 per cent respectively next year, buoyed by tax-free incentive on 300 imported goods announced in the 2011 Budget. The Malaysian Association for Shopping and Highrise Complex Management (PPK) president H.C. Chan said its members are confident that the shopping industry will register double-digit growth by next year. "Members previously felt the industry would register single-digit growth. With the tax abolishment, they expect double-digit expansion. The industry is looking at between 10 and 15 per cent growth for next year. "They hope that higher FDIs (foreign direct investments) will provide a multiplier effect that will push for higher industry growth," Chan said. He was speaking at a joint press conference with Malaysian Retailer-Chains Association (MRCA) and Malaysian Retailers Association (MRA) in Petaling Jaya, Selangor, yesterday. Chan described the tax-waiver proposal as "bold" and "strategic" to promote Malaysia as a key shopping destination, of which shopping mall rents are one quarter of Singapore's and one eighth of Hong Kong's. "The announcement is a breakthrough for the tourism and shopping industries. What it means is the operational costs would be much lower," he said. PPK adviser Joyce Yap expects the retail industry to post 10 to 12 per cent growth in 2011, although retailers group MRCA only anticipates 6 per cent growth. "Prior to this, the retail forecast was between 5 and 8 per cent. Now, more than 90 per cent of the retailers at the Pavilion, for instance, are raising their sales target to between 10 and 12 per cent. "We are confident they can achieve that," said Yap, who is also Kuala Lumpur Pavilion Sdn Bhd chief executive officer for retail. She expects more international brands to open outlets in Pavilion next year. "Two international brands that we have courted for about a year are knocking on our doors. Initially, we are looking at bringing one brand in 2011 but now there are five already making contacts. "The minimum investment they are bringing in to do the fit-out (at the Pavilion) is between RM3 million and RM5 million. It is a good size," she said. The MRCA is bullish too, but remains cautious on the global economic scenario. "As far as MRCA is concerned, our forecast for 2010 is still within the range of 5 to 8 per cent," its secretary general Valerie Choo said. "For 2011, the target is slightly lower, between 5 and 6 per cent, because of the global scenario," she added. "The proposal is a boost to consumers spending. I can say that positive consumer sentiment is back. Once consumers start spending again, the multiplier effect on the economy is very great," she added. MRA vice-president Datuk Ameer Ali Mydin said the proposal was crucial to help businesses remain competitive and reduce costs. It will not only benefit tourists but also the locals who can now buy branded goods at lower prices, Ameer said. KUALA LUMPUR: SUNWAY HOLDINGS BHD has entered into a memorandum of understanding (MoU) with Shanghai Zhushengyuan Real Estate Co Ltd (SZRE) to explore the feasibility of a proposed mixed development project comprising commercial and residential units in “Wuguang New City” in Wuguangxincheng, Changsha, China. The MoU was also signed to explore the feasibility of other projects in China. In a filing to Bursa Malaysia on Friday, Oct 22, Sunway said that under the MoU, both parties would evaluate the feasibility of the proposed development by utilising the expertise and experience of each party. They will also jointly bid, invest, construct and develop the land plots for the proposed development in Changsha and other projects in China, it said. It said the MoU would be valid for a period of 18 months, unless extended by Sunway and SZRE. On the rationale for the MoU, Sunway said the overseas market was a major source of its revenue. Sunway said it has established a strong business presence in China in view of the country's huge population and high economic growth. “The MoU is in line with Sunway’s strategy of expanding further into adjoining businesses and accessing the China market. “The MoU will give Sunway the opportunity to explore the feasibility of developing a large landbank and to negotiate terms and conditions that are mutually beneficial to Sunway and SZRE,” it said. SUNWAY Holdings Bhd signed a me- morandum of understanding with Shanghai Zhushengyuan Real Estate Co Ltd (SZRE) to bid and work on projects together in China, starting with a mixed-development project in Changsha. They will evaluate the feasibility of the proposed development and will jointly bid, invest, construct and develop the land. SZRE is a property developer with a registered capital of RMB131 million. KUALA LUMPUR: Sarner IXL Sdn Bhd, which will invest a total of RM62.5mil in a major tourist attraction project in Malacca to be known as “Malacca Alive, History In a New Way”, is targeting to achieve 800,000 to 1 million visitors in the first 12 months of its operations. Sarner president Mohd Nizar Mohd Najib said the first phase of Malacca Alive would be completed by April next year and the second and final phase slated for completion in 2012. The Malacca Alive tourism project is located in Bandar Hilir which was declared a Unesco World Heritage Site. Mohd Nizar said the crown jewel and focus of attraction of Malacca Alive would be Bahtera Merdeka, which offers visitors the experience of 5D, the first of its kind in Asia. “Visitors will experience the birth of a nation, from the start of Malacca through the years of prosperity until the beginning of Malaysia, and the venue can also be used for other purposes including concerts,” he said at a press briefing yesterday. Malacca Alive would also have a couple of museums such as the 4-D theatre Rakyat museum showcasing Malaysia’s natural history and a time travel museum which gives visitors the experience of going back in history. Moreover, there will be 50 retail outlets and outdoor warisan complex bistro as well. Malacca Alive and the museums are build under the auspices of Perbadanan Muzium Melaka which is tasked to manage daily visitors at the tourist sites. Mohd Nizar said phase one of Malacca Alive cost slightly over RM21mil, while phase two would cost RM41.4mil. The project would be financed via bank borrowings. There will also be a grand tour of the place through various modes of transport. KUALA LUMPUR: HUNZA PROPERTIES BHD net profit for the first quarter (1Q) ended Sept 30, 2010 surged 273% to RM34.69 million from RM12.69 million a year ago, on the back of a 13% increase in revenue to RM64.53 million. Earnings per share was 18.39 sen while net assets per share was RM2.36. Hunza attributed the higher revenue and profit mainly to improvement to FRS 140 Investment Properties, whereby it measures investment property under construction at fair value on a yearly basis. It also said the physical construction for the two residential towers of Gurney Paragon had been progressing well and cumulative percentage of sales was now higher at this juncture, contributing to higher attributable revenue. On its prospects, the company said it was confident of a strong performance for the 2011 financial year. KUALA LUMPUR: HAI-O ENTERPRISE BHD unit, Hai-O Properties Sdn Bhd (HOP), has entered into a share sale and shareholders agreement with Sierra Equatorial Development Sdn Bhd (SED) to venture in the property investment and development business. In a filing to Bursa Malaysia on Friday, Oct 22, Hai-O said the agreement was for HOP and SED to establish a long-term relationship via their participation in Hai-O Development Sdn Bhd (HOD), a wholly owned subsidiary of HOP, for mutual benefit and gain in undertaking the business of property investment and development in Malaysia. Under the agreement, SED will acquire from HOP 48,000 ordinary shares of RM1 each, representing 40% of the current total issued and paid-up share capital of HOD for RM1,000. SED will also assist HOD in applying and procuring all necessary licences, approvals, permits and consents required undertaking the business. It will also assist in the completion and market any development project undertaken by HOD, as well as provide the necessary expertise to HOD to train and develop a team of personnel to carry on and manage the business. PETALING JAYA: Kenmark Industrial Co (M) Bhd has sold a vacant piece of industrial land in Klang via an open tender exercise for RM15mil, the company told Bursa Malaysia yesterday. Of the total amount, RM14.25mil will be used to settle the redemption sum on the property due to EON Bank Bhd. The property was charged for a banking facilities granted earlier. “The disposal is to partially settle the total amount owing to EON Bank under the charge,’’ it said.